The keys of the piano were worn away and sometimes the notes would not sound but the tone was soft and mellow and Stephen used to sit down and sing his beautiful songs to the polite, tired, unmusical audience. 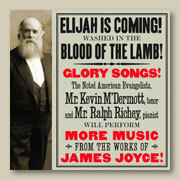 On the CD, MORE Music from the Works of James Joyce, these songs are performed by Mr. Richey as purely instrumental pieces. For the sake of thoroughness, however, we provide here the traditional words that most often accompany two of these melodies. Deo gratias Anglia redde pro victoria.